Ocean Front Building! 3br/3ba Penthouse W/ Ocean & Bay Views, Pool, Wifi + more! UPDATE 2019: NEW FLAT SCREEN SMART TV WITH NETFLIX, AMAZON PRIME, & HULU APPS IN THE LIVING ROOM AND NEW BALCONY FURNITURE WITH SEATING FOR 8+! Stunning Beach to Bay Views from your private 60' TOP Floor Wrap-Around Balcony just STEPS to the beach! Escape to Adagio 514, where the Balcony becomes your new living room and the water's edge your primetime entertainment! This exquisite 3 Bedroom 3 bathroom TOP floor corner unit offers seclusion and privacy most units cannot provide. (THINK: no pesky footsteps above your living room!). Unique to this unit is the 60' wrap-around Balcony that captures an abundance of sunlight throughout the day and offers breathtaking panoramic views that span the entire width of the island - from beach to bay! Relax on the Balcony with friends and loved ones while watching waves crash on the shore in the morning and revel in the picturesque sunsets on the bay in the evening. PLUS, the bay side offers complete privacy with no adjacent neighbors! Beautifully decorated and over 1,550 sq ft with hand-painted murals, cozy furnishings, fully equipped Designer Gourmet Kitchen with breakfast bar, spacious Living Room, Dining Area and laminate flooring - this home has everything you need for a carefree vacation. Sprawling floor plan features a Master Bedroom with an large ensuite 5 fixture bathroom and 2 additional bedrooms and 2 additional modern bathrooms - perfect for large family groups vacationing together. Additional luxuries include Central A/C, Gas Fireplace, multiple TVs/DVDs, FREE Wi-Fi and full-size Washer/Dryer. The Adagio, built in 2002, is one of Ocean City's premier Ocean FRONT buildings in a prime central location and just STEPS to the beach (Atlantic Ave @ 59th St) with VERY convenient access at traffic light intersection. Life at the Adagio is all about one thing: RELAXATION. Spend a day of tranquility on the Beach or take a refreshing dip in the large, Indoor Heated Pool with hot tub. Guests have access to exclusive amenities, including a Sundeck on the 2nd Floor and outside shower for rinsing off after fun in the sand. The Adagio is conveniently located near the Route 90 Bridge at 60th St. in one of the quietest and least-crowded sections of Ocean City. It is within walking distance of some of Ocean City's best restaurants and hotspots, and only minutes away from the Boardwalk, amusements, shopping, recreational sports and world-class golf. * This property is only available for Saturday check-in during the season and FlexStay during the off-season (check-in any day of the week, 3- or 4-night min). Please speak with the owner to confirm when the off-season begins for this property. No smoking in the unit or on the private balcony. No pets allowed. My husband & I have been vacationing in OCMD for nearly a decade. We started a family and wanted a more permanent place for our annual vacation. Hence our purchase of this beautiful home! 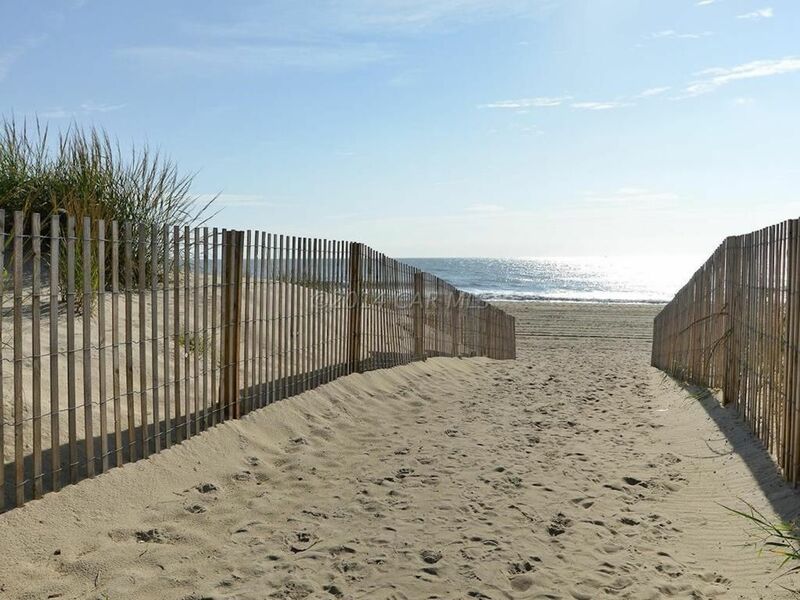 Since we live in NYC and only spend a few weeks in Ocean City, we are happy to offer our beach home to you! We had always been keen on staying in midtown whenever we stayed in Ocean City. We loved the quieter, family-oriented beaches, the access to the fun restaurants and hotspots and yet enjoy the proximity of going to boardwalk for those nights we were craving fries and cotton candy! The Adagio is one of OCMD's premier buildings, constructed in 2002, it has all the modern amenities you could wish for including elevators, designer kitchens and baths, balconies, onsite parking, pool, sundeck, fitness center and lest of all its BEACHFRONT access!! This is a unique building with an Atlantic Avenue address with easy access via traffic light and just off the 60th street bridge. It doesn't get any more convenient than this! For starters, we were immediately drawn to the wrap around 60' balcony spanning East (beach), North, and West (bay) with amazing views and capturing an abundance of sunlight from morning 'til evening. The floor plan is ideally configured for a nice size group who benefits from having 3 full bathroom and 3 large bedrooms and a spacious living/dining/kitchen. The unit has panoramic views of the beach/ocean and bay! Both the ocean AND the bay! Additional seating at adjacent breakfast. In total can accommodate 8 ppl. Private wrap-around 60' balcony with ocean to bay views! Hard to find! Great place, great location. My only suggestion would be to not have such a high cleaning fee attached and then also expect the occupants to clean prior to leaving. Thank you Alley, for your beautiful room. My husband, and two other couples rented your room for a fall vacation. We all have grown children now and try to get together once a year. It is so hard to find 3 bedrooms/bathrooms for adults! The 3rd bedroom always has bunk beds! Loved the location, we did not drive to anything. Walked to the restaurants we ate at, and took the bus to the boardwalk one afternoon, rented a pontoon boat one day, and were on the beach the other two days. Again, thank you and also thanks for always answering my questions so quickly!! Loud week. Was unaware H2oi was in town and very loud. The building should be power washed. The door to unit 514 was VERY dirty. The pool and hot tub were closed. We were looking forward to the indoor pool. The unit overall was nice and comfortable. Thank you for your candid feedback. I am glad you enjoyed our home and found it comfortable and clean. I am sorry the pool and hot tub were not in operation during your stay. I followed up with the managing agent who said the heater had to be repaired. It is a shame as I would have loved to have you enjoy it as well. Earlier in the year it was announced the H2Oi car show was moved to Atlantic City, NJ. I am sorry to hear there seemed to still be a loud turnout in OCMD. I will look into having the front door cleaned as it does need it frequently and with the recent storms, the elements are not forgiving to the north side of the building! I do hope you will consider staying with us again, and perhaps not during any car shows next time :-)! Plenty room for the family, Beautiful beach decorations, bright and airy. We loved the stay and will come again. Thank you so much for your testimonial! So glad it was a great fit for your family. There were 4 Adults on this trip. The location was well situated for getting to the beach and the rooms themselves were comfortable. The owner checked in a few times to make sure there weren't any problems. We had a great time there and lool forward to getting back there again soon! It was so nice having you as our guest. So glad you enjoyed your stay and hope to have you stay with us again in the future! Great location, very comfortable accomodations! This was a very nice, comfortable unit for my husband and I and our adult children and grandchildren. The layout is great and the unit is spacious. We had everything we needed and found it very conveniently located to grocery stores, many of our favorite restaurants and, of course, the beach. This particular unit has beautiful sunset views. Prior to our trip, I reached out to the homeowner and she responded very quickly (within minutes) to provide the information I was looking for. I'm so happy our home was a great fit for your family trip to the beach! It's so nice to know a couple generations are making memories at the shore! Thanks again! Please ask me for my personal guide I created for guests for preferred restaurants, entertainment, amusement, and more in Ocean City, West Ocean City and Fenwick Isle, Delaware!